Home / Articles / Farewell to a Pride…….. 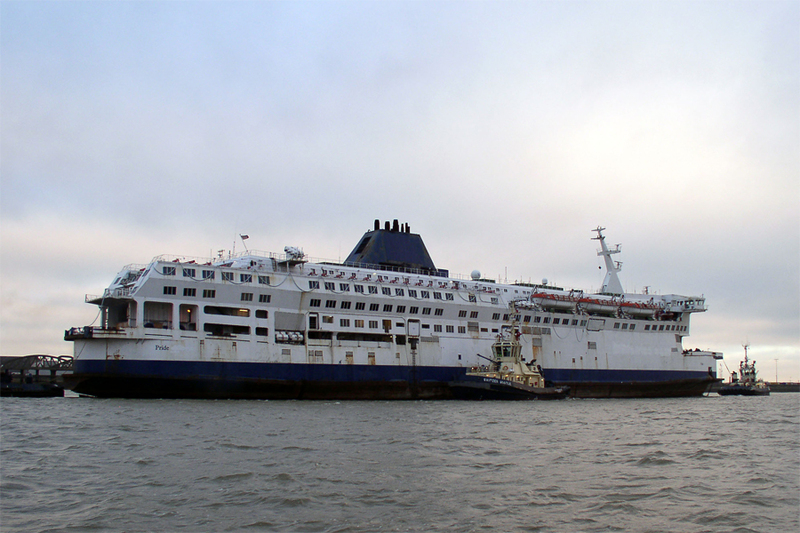 The Pride of Dover arrived in the Essex port of Tilbury from Dover on the 16th December 2010 having finally finished on the Dover-Calais service on the 15th December 2010. 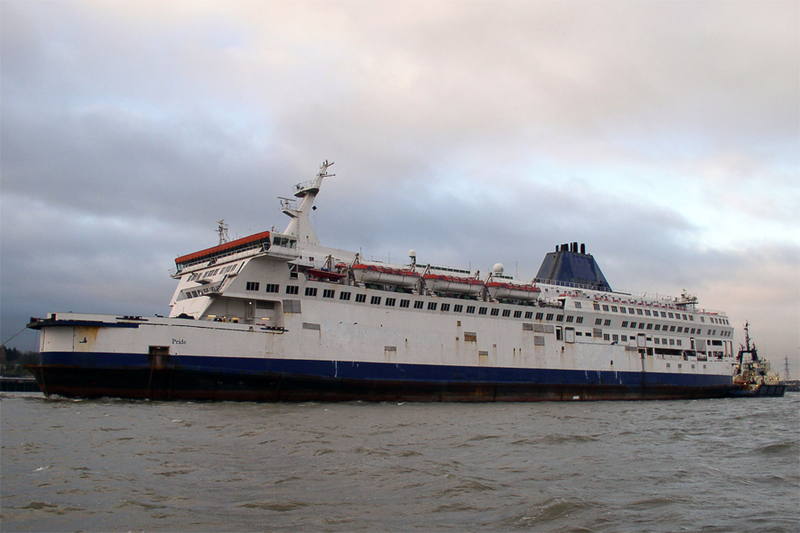 She was replaced in the local P&O Ferries fleet in January 2011 by the new super ferry Spirit of Britain . 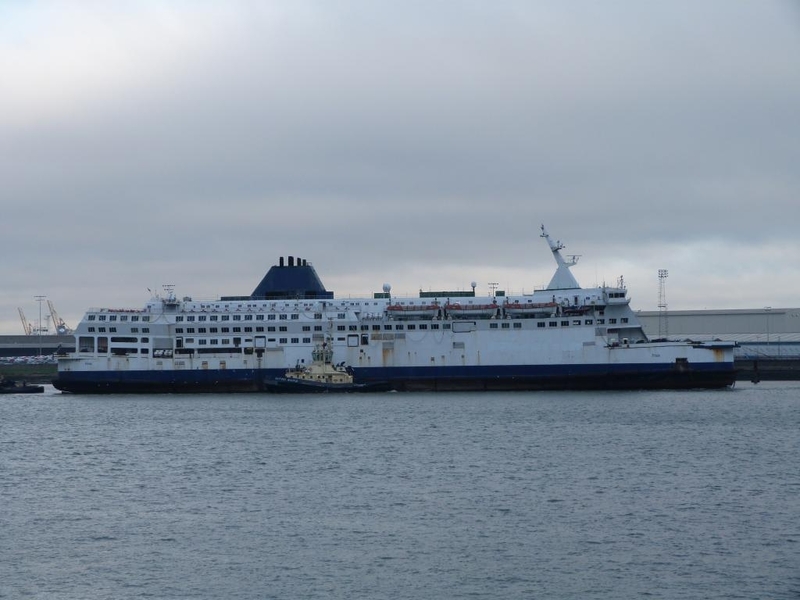 During the following months rumours came and went in regards to the future deployment of the vessel. 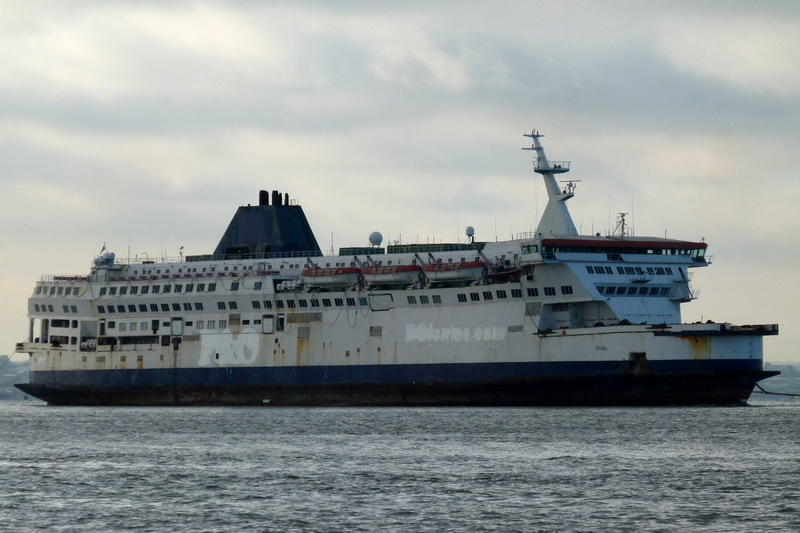 She was repeatedly linked with a move to South Korea, there was even talk of her returning to Dover following the demise of Seafrance at the end of 2011 but nothing came to fruition. 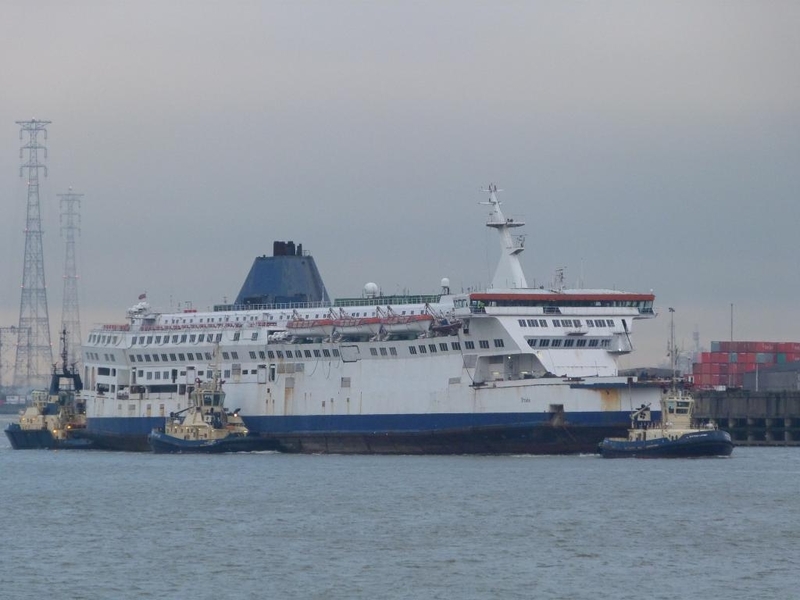 On the 6th November 2012 P&O Ferries announced that the Pride of Dover had been sold to `German Shipping Interests’ and would eventually be towed away from Tilbury for repairs. 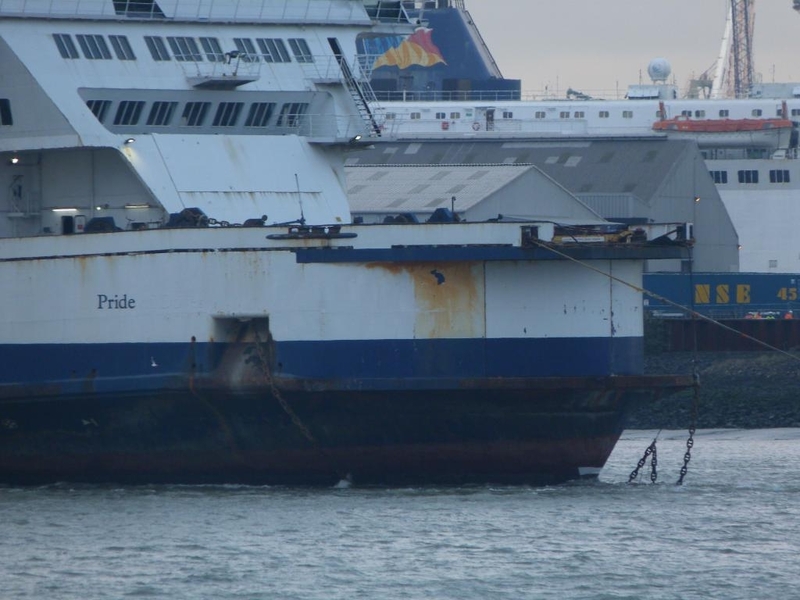 Following the announcement of the sale the Pride of Dover had her P&O Ferries livery removed and she was renamed `Pride’. A series of adaptations were made to her forward mooring deck to fix the required towing equipment. This included the welding of hard points on the ships fo’c’sle and removal of the ships anchors. Additionally a barrier was built across the stern aperture of her upper car deck just in case the tow was lost and she ended up going stern first into heavy seas. 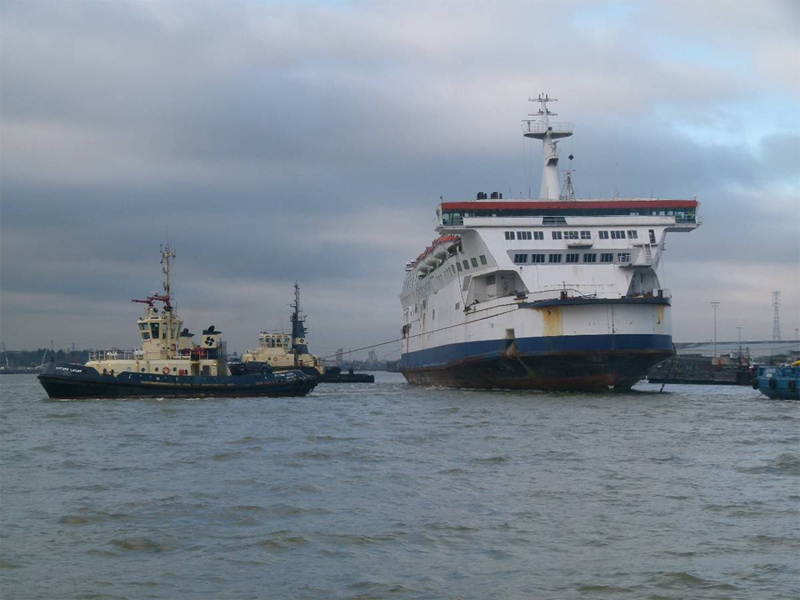 The Eide Marine Services anchor handling tug `Eide Fighter’ duly arrived in Tilbury docks on the 20th November 2012 ready to take up the tow. 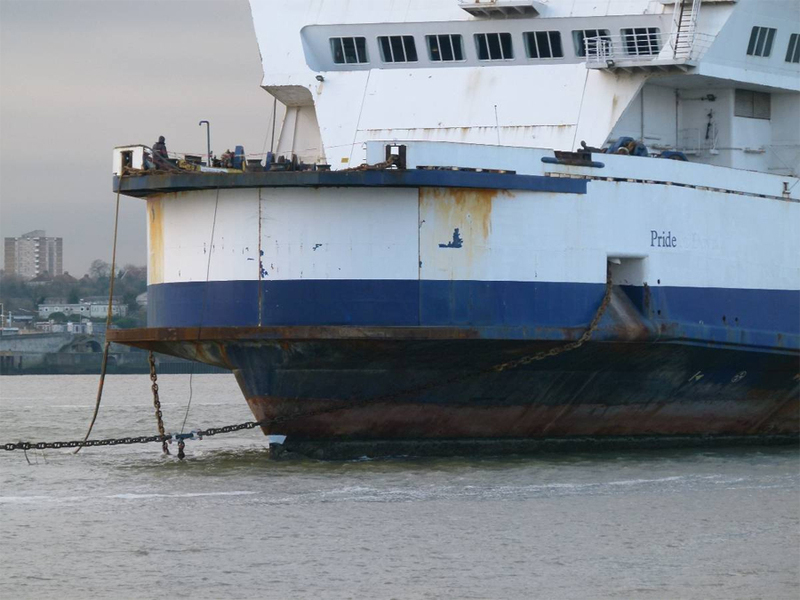 At a little after 0800 on a freezing cold 29th of November the `Pride’ started what will more than likely be her final journey from the UK (depends if you believe the speculation or not!). 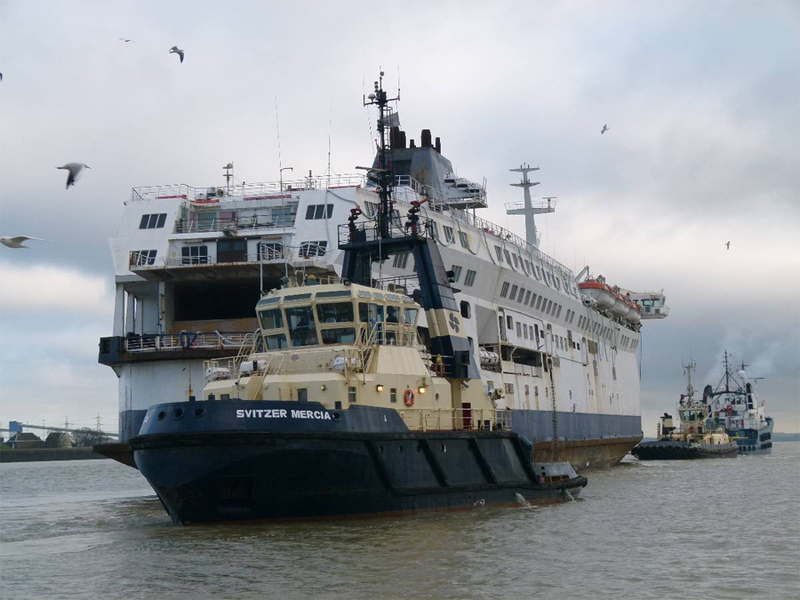 The local tugs Svitzer Mercia, Svitzer Bootle and Svitzer Laceby gently shepherded the Pride into the Tilbury lock before she was taken out into the river Thames to travel the short distance to the Tilbury landing stage. Once upon the stage she was made fast to the deep sea anchor handling tug `Eide Fighter’ for her long journey to Tuzla in Turkey for `repairs’. 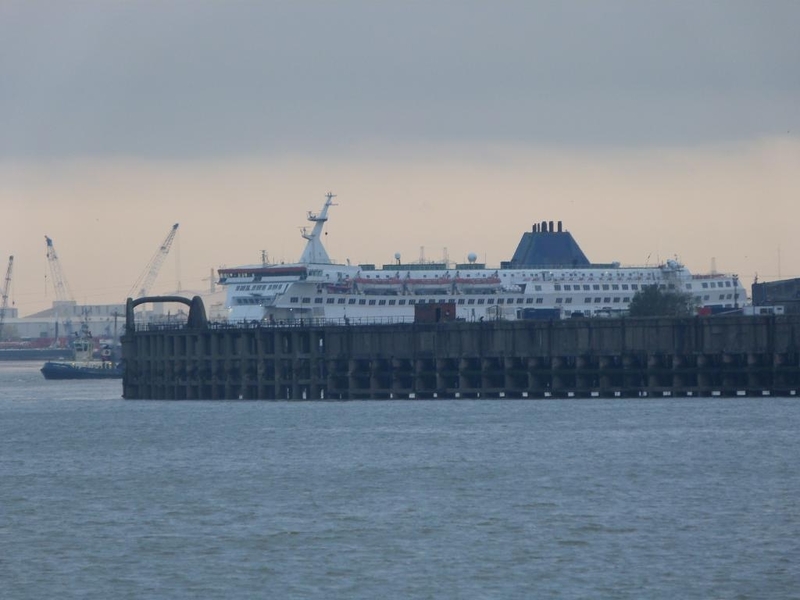 Having departed Tilbury the tug and tow made steady progress along the North Kent coast before rounding the North Foreland and entering the Dover Straits. The convoy eventually passed Dover at 22:30 (GMT) at a distance of 7.2 miles. 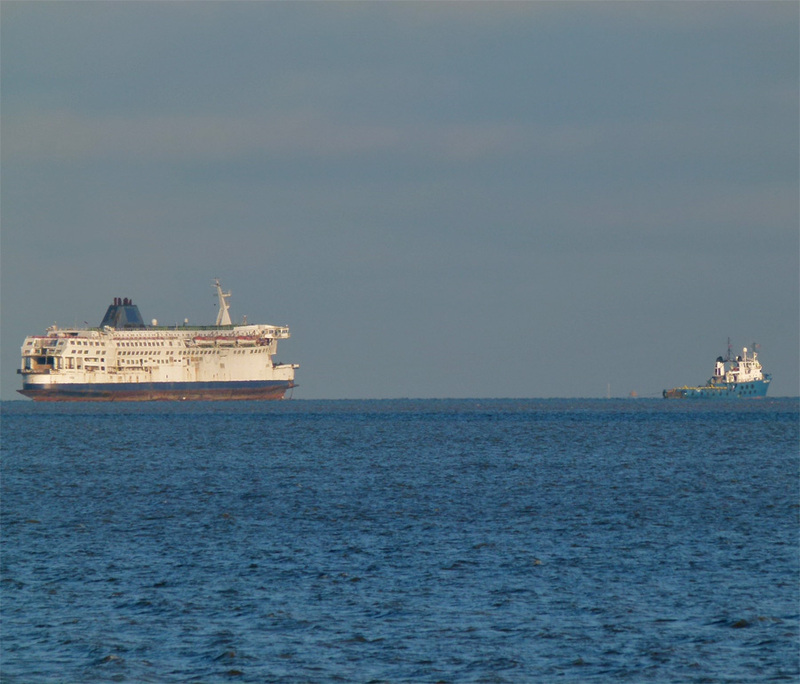 The tug and tow made good progress down the Channel passing the Isle of Wight on the 30th November. With the weather outlook for the Bay of Biscay not looking favourable for a crossing the Eide Fighter changed course on the 1st December for Lyme Bay off the Devon coast to ride out the worst of the weather. After four days off the South Coast the tow finally departed Lyme Bay and continued on her original track ready to cross the Bay of Biscay. 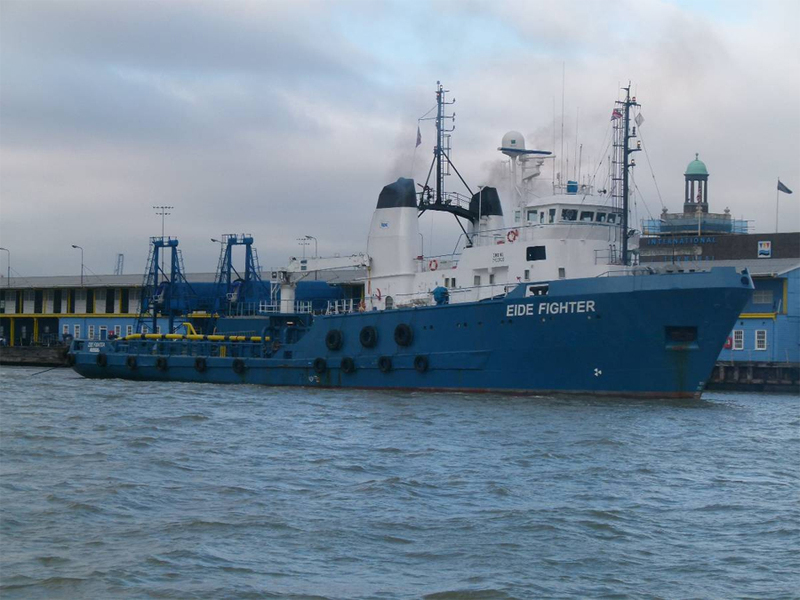 On the 8th December the Eide Fighter was observed off the Spanish coast 50 miles North West of La Coruna having successfully transited the Bay of Biscay. She transited the Straits of Gibraltar on the 13th December and is now due to arrive in Tuzla on the 25th December (Christmas Day). For those who are interested the Eide Fighter can be tracked via AIS using the window below. Please note that it is subject to her being in range of shore based receiving stations during the crossing. 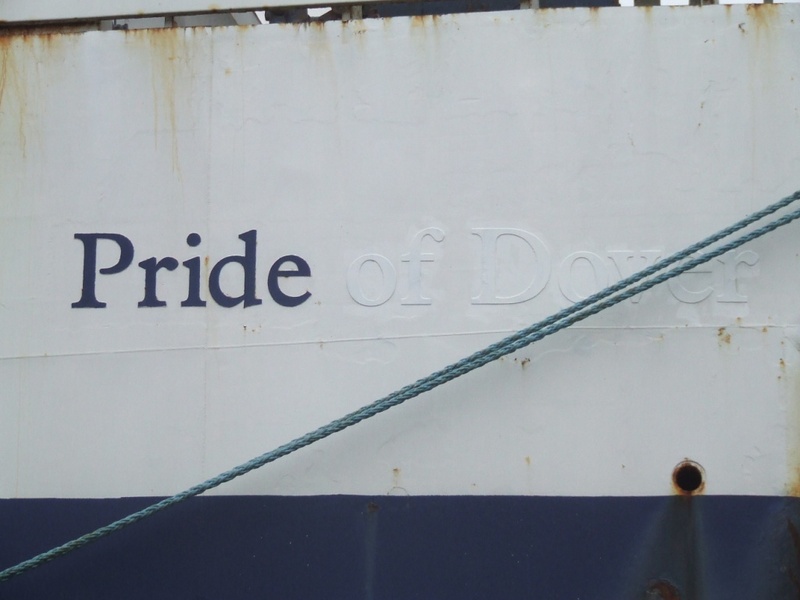 To be honest I am not going to speculate on the future of the Pride of Dover as there is way to much speculation going on as it is. All I would like to say is I wish the vessel well with her new owners, whoever they may be and for whatever purpose they propose to use her for. I will always have great memories of the Dover, God speed old friend. All items included in this article are subject to © copyright. We would like to take this opportunity of thanking: Carl Tunnicliffe, Paul Cloke, Mike Jackson, Dave Parry and Ted Ingham for there assistance in producing this article. 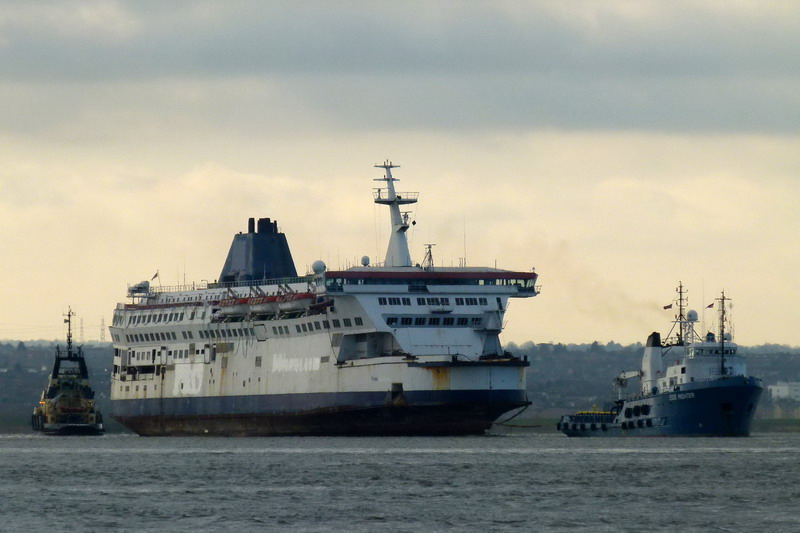 Thankyou for this brilliant article, I’ve followed the departure of the Pride of Dover on AIS & YouTube, fond memories of her as my first ship on joining p&o. (Now PO canterbury). 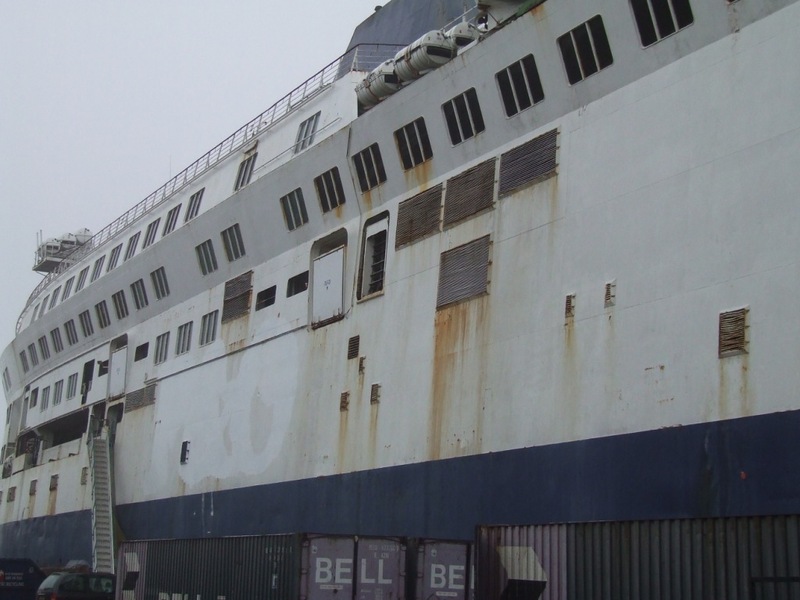 It brought a lump to my throat when the voice of harbour control calls her a “dead ship”. Great article, thank you. Hi Jane, thank you for the kind words and the feedback about the article, I am glad you liked it. I agree with you totally, it was painful to hear her being called a dead ship, I loved working on her for recalls and refits. 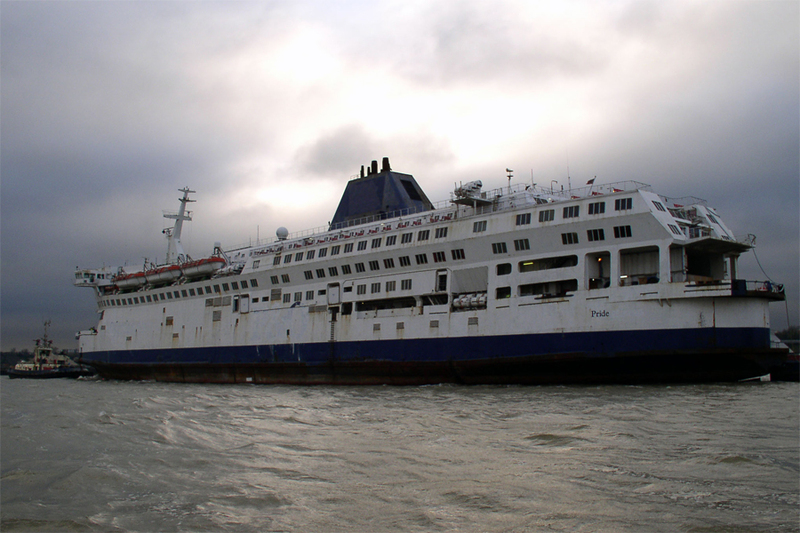 I was on the European Endeavour, the OLD pride of bruges (ex pride of free enterprise), the burgundy well many of them but the dover was special. I know the calais is her twin sister, but the calais never came up to par with me. even when they were both delivered, with the old TT interiors, somehow, the dover always was better, stonger cant explain it. 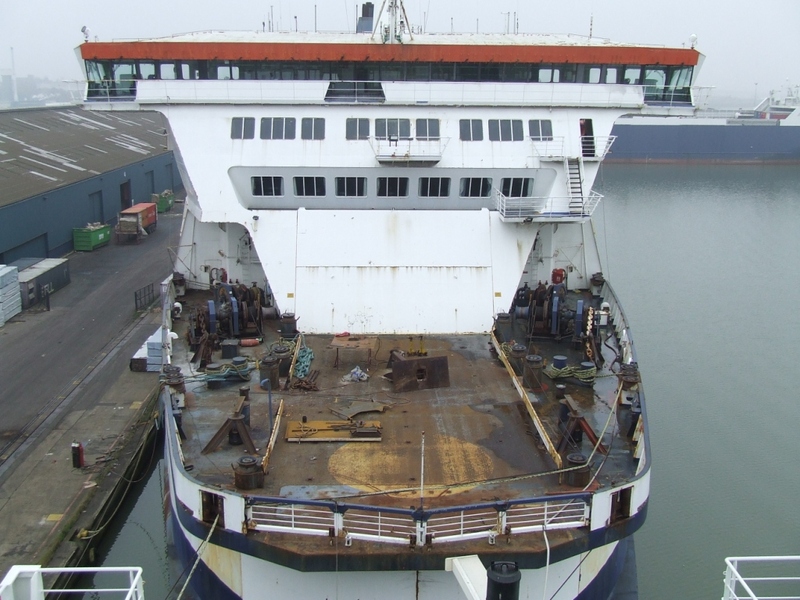 I do hope there will be a last minute reprieve for her, she has worked hard, stood the test of time and lets face it, is a very well designed ship. LOVED the article. Ray, do I know you from P&O (dover/portsmouth)? 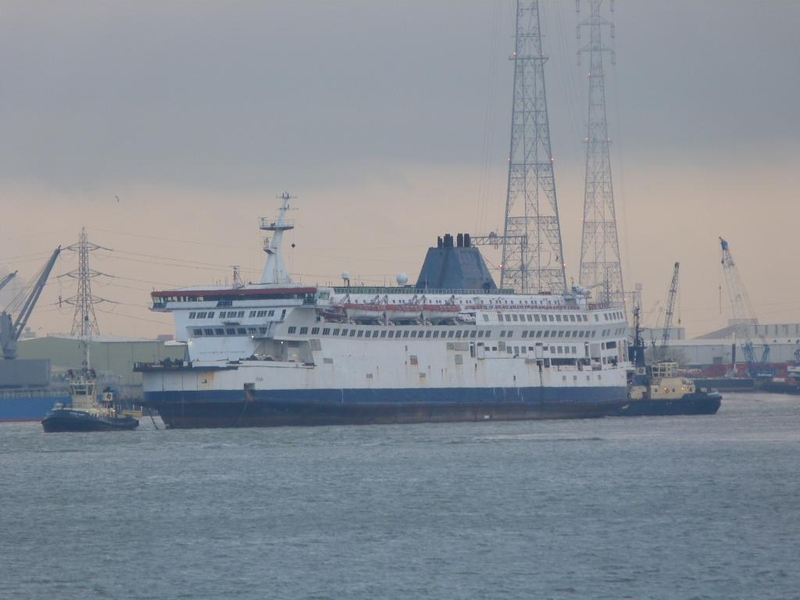 The Calais, after a brief spell with TransEuropa Ferries as the Ostend Spirit is now back under P&O Ferries management following the collapse of TEF and she is currently laid up in Tilbury. I hope she doesn’t follow in her sisters footsteps to Turkey but I have to admit that the future certainly doesn’t look bright for her. 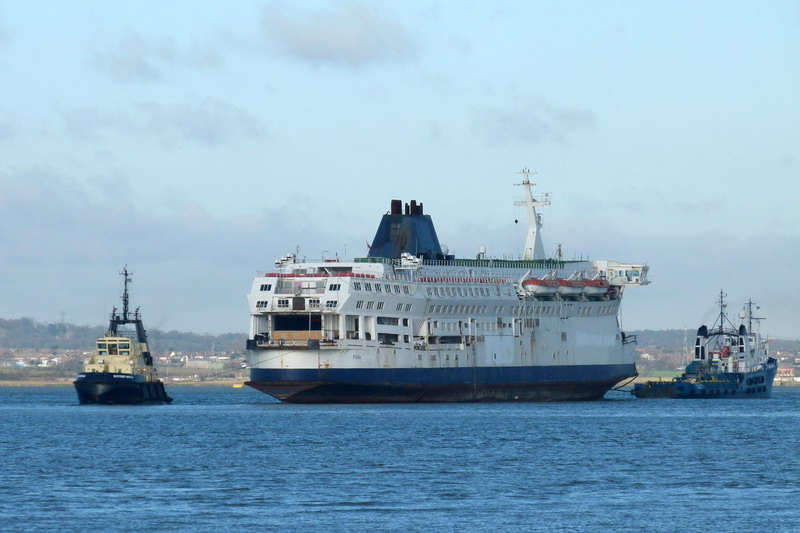 My only association with P&O Ferries is that of a very regular passenger here at Dover and I did frequent the Portsmouth routes a couple of times a year when they were still in operation. My late step father was a 2nd officer with Townsend and P&O, his name was Alan Sugden (known as `Gunner’) and he served on many of the Dover fleet during the end of his sea going career. 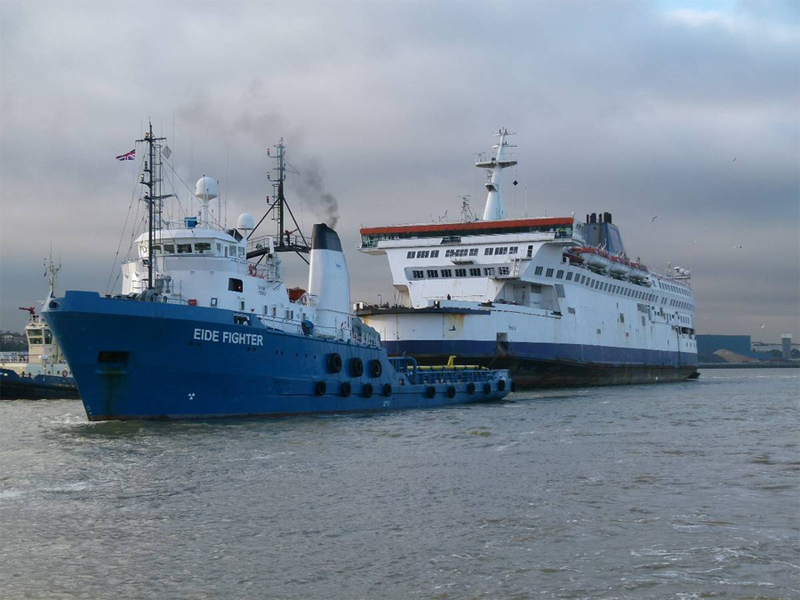 His last vessel was the European Endeavour (ex European Enterprise).